The Aboriginal Housing Office (AHO) has commissioned Yindyamarra Consultancy to undertake a series of listen and yarn sessions with Aboriginal Housing clients, Aboriginal Housing Providers and other relevant stakeholders in five locations - Dubbo, Moree, Tamworth, Nowra and Penrith. The stories and feedback from these sessions will be used to improve the delivery of social and affordable housing for Aboriginal people in NSW under its strategic framework Strong Family, Strong Communities. Click here to read more about the AHO Strategy. · 28 OCT - ELSTON PARK, DUBBO. 1pm-5pm. 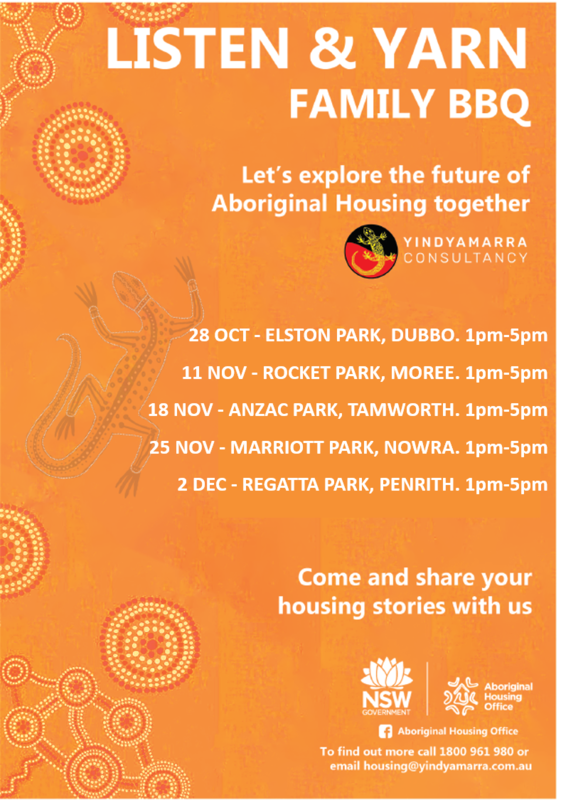 If you have any questions about what we are doing in these locations you can contact us on toll-free phone 1800 961 980 or email us at housing@yindyamarra.com.au. You can also contact us if you wish to register your interest to participate in our listen and yarn session. Anything you say to Yindyamarra is completely confidential. People’s responses will not be identified and will not affect them in any way. Your housing provider and AHO management will receive general findings and will not see individual answers. Watch out this space for exact venue details and more information.